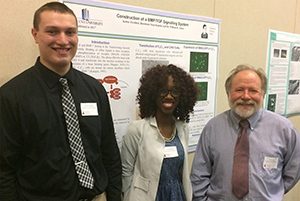 (From left) Upper Iowa University biology majors Kolter Freidhof of Cresco, Iowa, and Baridosia Kumbe of Port-Harcourt, Nigeria, are pictured alongside UIU Assistant Professor of Biology William Jones during the recent McElroy Research Symposium in Waverly. An alumnus and two current Upper Iowa University School of Mathematics and Science students presented their recent research before members of the R.J. McElroy Trust in Waverly, Iowa, Tuesday, April 18. The three presenters, Matt Meulemans, Baridosia Kumbe and Kolter Freidhof were recipients of grants from the R.J. McElroy Trust, based in Waterloo, Iowa. 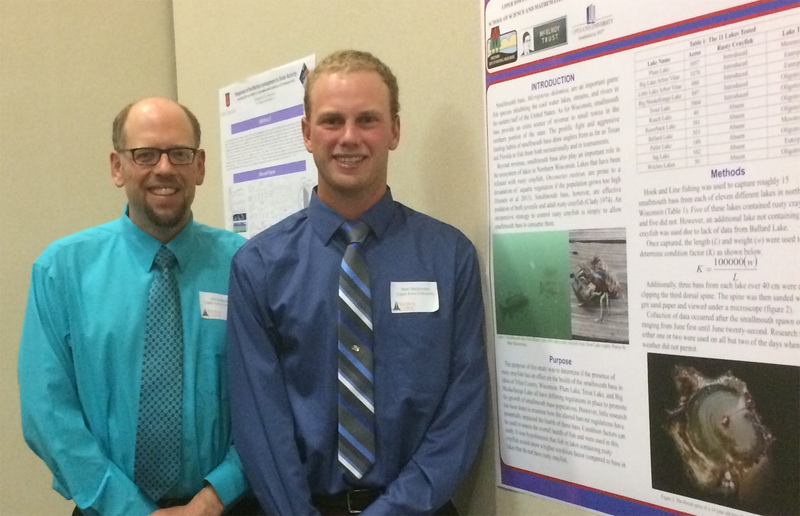 Upper Iowa University senior Matt Meulemans (right) of Kimberly, Wisconsin, presented his research on the health of smallmouth bass in lakes in north central Wisconsin to members of the R.J. McElroy Trust in April. Meulemans is pictured alongside UIU Associate Professor of Chemistry Jeffrey Butikofer.